Cycling on the banks of the Red River on a quiet dyke road we’ll pass through flower and vegetable gardens, village lanes and alongside lotus lakes to give you a whole new view of Vietnam’s capital city. We’ll meander around West Lake and stop at one of the most revered Buddhist pagodas in Vietnam. You’ll be surprised at how little traffic we’ll encounter as you explore a side of Hanoi that’s well off the beaten path. What will we see? We depart from the Pan Pacific Hotel at 8:30 am and head down hidden back alleys to see where the real Hanoi lives. After winding our way through we leave the concrete of the city behind to open farmland along the banks of the Hoang Giang River. We visit a broom making village as we head towards Co Loa, an ancient spiral-shaped citadel that dates back to the third century BC. After riding around the citadel and a stop at An Duong Vuong King Temple we'll have a break for a local lunch. We next cycle on top of the dike along the Red River, named for the reddish-brown heavily silt-laden water, where we will see where two great rivers meet. Here we board a small ferry to cross the Duong River as we pedal to the north side of West Lake, the largest of many lakes in the city. We ride along the water’s edge to one of the most important places of worship in Hanoi,Tay Ho temple, and learn the legend of the golden buffalo calf. We’ll pedal on through quiet back streets, admiring the colonial architecture, before returning to the Pan Pacific hotel around 4 pm. To make sure we don’t miss an important cultural event, this itinerary may be adjusted if there is a festival or other special activity nearby. What is the riding like? We ride approximately 42 km on good quality flat tarmac roads. There’ll be plenty of opportunities for taking photos and just taking in the wonderful scenery. Anything else? Lunch is typical Vietnamese cuisine served at a local riverside restaurant. Of course, water, soft drinks, snacks and lunch are included during the tour and SpiceRoads supplies a TREK mountain bike and helmet. Can't find a departure that works for you? Make any tour a private tour and depart on the day that's best for you. Mr. Dan and Mr. Qun (the driver) did a great job. I really enjoyed the ride especially at the country side. Mr. Dan had done a great job guiding us through the small alley house and crossing the river. I also enjoyed the seafood lunch and for sure will join your tour in the near future. My husband and I had a spare day in Hanoi, and, wanting to break away from the busy streets decided to do a 1 day cycle trip round Hanoi. This proved to be a fabulous day, cycling through the busy streets for 1k, over the bridge, then out into the villages, visited some temples, lunch was very good, plenty of it, and delicious our guide was great, and, we biked round West Lake which was a new area for us, so were very pleased to see this part of Hanoi, would definitely recommend. Great way to experience the hustle and bustle of Hanoi streets. 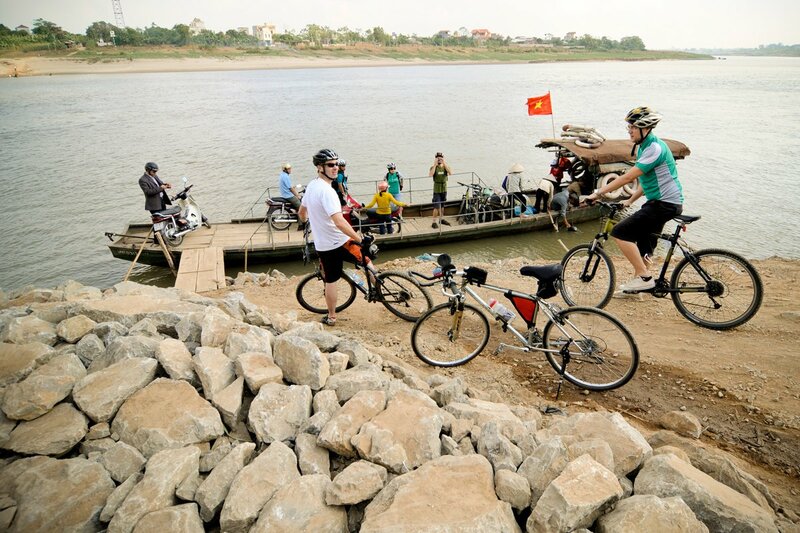 Leave the chaos of Hanoi behind for a day as you cycle through farmlands and villages surrounding Hanoi. Cycling on the banks of the Red River on a quiet dyke road. We’ll pass through flower and vegetable gardens, village lanes and alongside lotus lakes to give you a whole new view of Vietnam’s capital city. We’ll meander around West Lake and stop at one of the most popular temple in the city. You’ll be surprised at how little traffic we’ll encounter as you explore a side of Hanoi that’s well off the beaten path. We depart from the Pan Pacific Hotel at 8:30 am and head down hidden back alleys to see where the real Hanoi lives. After winding our way through we leave the concrete of the city behind to open farmland along the banks of the Hoang Giang River. We visit a broom making village as we head towards Co Loa, an ancient spiral-shaped citadel that dates back to the third century BC. A standard mountain bike is included in the tour, however, you can also hire an electric bike (or an E-Bike) for the price listed in the tour pricing section. We have 2 sizes available: S = 155 cm - 170 cm and M = 171cm - 180 cm. The E-Bikes are GIANT brand with SHIMANO Alivio1,9 speed, disc brakes, and adjustable suspension fork. We ride approximately 42 km on good quality flat tarmac roads. There’ll be plenty of opportunities for taking photos and just taking in the wonderful scenery. From the tour page click the 'Book Now' link. All departures for this tour will appear, just select the date you'd like to travel. There is a minimum number of participants (usually 2) required to enable the trip to go ahead. Once the minimum number is reached, the trip status will change from 'Available' to 'Guaranteed to Depart'. Once a trip is guaranteed to depart you are free to book your flights and make other travel arrangements. If you are unsure about the trip status, please email us or call our office. For the next steps you'll need to know the names of the people traveling and have either a Visa or a MasterCard. If you wish you can also provide extra details such as passport numbers, height, or you can add that later by logging into Manage My Trip (we'll set up an account for you automatically if you don't already have one). However, if you wish to get a children's discount, please do fill out the date of birth of the riders. If you are having any problems, please send us an email, or give us a call (+66 2 381 7490) and one of our travel specialists will assist you with your booking. For Long Tours (7 days or more) to guarantee your place we require a 30% or 500 USD deposit, whichever is the greater. For Short Tours (6 days or less) we require full payment to guarantee your place. We also require that you take out travel insurance when you book your holiday. Besides covering you during your holiday it will also enable you to claim for any money that you have paid to us, including your deposit, should you have to cancel your trip. Full payment must be paid 45 days before the departure date with fees for any bicycle rental(s), single supplement(s) and extra hotel nights. Our confirmation will include personal details you provided us (including your flight information), visa application advice, a packing suggestion list and a detailed tour itinerary. It will also include a checklist to ensure you get everything ready for your holiday. On the rare occasions when we, SpiceRoads, must cancel a trip, all payments received to date will be 100% refunded, which constitutes full settlement. There will be absolutely no deductions. If you, the client, must cancel your reservation, your cancellation fee will be determined according to when you cancel. For full details, please read our cancellation policy. For those who have been on several long tours with us we reward customer loyalty by offering repeat customers a special discount off the tour price (excludes single supplement and bike rental). If this is your fourth scheduled tour or more you will receive a 5% discount. If this is your eighth scheduled tour or more we will extend a 10% discount. The discount will be reflected in your online booking, but please contact us if any questions. Loyalty discounts can not be used in conjunction with any other offer. Note: Only tours of 7 days or more will be applicable for loyalty discount. International flights, to and from the start and finish points are not included in the tour price. Once your tour is Guaranteed to Depart you can book your flight. Please contact us for advice before arranging flights for the best arrival and departure times. We would only cancel a trip for an extreme circumstance, but in that case, where we cancel your trip, we cannot be liable for losses incurred relating to any flight booking you have made. Please claim any losses from your travel insurance that you acquired when you booked your holiday. Our adventure travel e-newsletter is full of travel news, trip information, interesting stories and contests. To avoid missing out on special offers and updates from SpiceRoads, be sure to subscribe.